SINGAPORE, 27 December 2013 – Singapore Changi Airport handled 4.46 million passenger movements in November 2013, an increase of 2.3% over the same month last year. In the first 11 months of the year, more than 48.6 million passenger movements were registered, a 5.1% increase on-year. Air traffic movements for the month grew 6.9% to 29,500 flights. Year-to-date aircraft movements totalled 312,800, an increase of 5.8% compared to a year ago. In the month of November 2013, growth in travel demand was strongest for Indonesia, Japan, and Malaysia among Changi Airport’s top 10 markets. Traffic to and from Denpasar (Bali), Kuala Lumpur and Tokyo similarly rose by more than 10% over the corresponding period last year. Airfreight movements registered a growth of 2.4% on-year, with a total of 161,000 tonnes of cargo handled during the month. Year-to-date, Changi Airport has handled close to 1.7 million tonnes of cargo, a slight increase of 0.9% compared to the same period in 2012. As at 1 December 2013, more than 100 airlines operate at Changi Airport, connecting Singapore to 275 cities in some 60 countries and territories worldwide. With more than 7,000 weekly scheduled flights, an aircraft takes off or lands at Changi roughly once every 90 seconds. New City Links – In December, China Southern Airlines commenced thrice-weekly services to Guilin, while Tigerair launched a new thrice-fortnightly service to Ningbo. Additionally, China Eastern Airlines has begun its four-times weekly service connecting Singapore to Wuxi in China. With the additions of Guilin, Ningbo and Wuxi, Changi Airport now has links to 30 Chinese cities, and remains South East Asia's most connected hub to China. New Services – Changi Airport welcomed the arrival of Regent Airways (IATA: RX) on 14 December 2013. The third Bangladeshi carrier to operate at Changi, Regent Airways will operate a five-times weekly service between Dhaka and Singapore. In addition, Scoot has launched a five-times weekly service to Perth from 12 December. New Store – Passengers in search for a comfortable place to enjoy good coffee and complementary food choices before their flight should visit the new Pacific Coffee outlet in Terminal 1’s Departure Transit Lounge. Changi Airport (www.changiairport.com) is the world’s most awarded airport with more than 450 accolades received since it opened in 1981. To serve passengers and visitors from the world over, there are over 350 retail stores and 120 F&B outlets across the airport's three terminals. 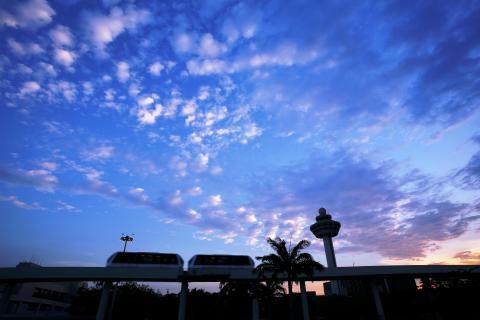 Changi handled more than 51 million passenger movements in 2012, an annual record. Today, it serves more than 100 airlines flying to 275 cities in about 60 countries and territories worldwide. A flight takes off or lands at Changi roughly once every 90 seconds.